From the back row of the Grand Theater, we imagined a scene as it unfurled 2,000 years ago  a noisy, overflowing crowd of 25,000 Ephesians roaring for a favored Roman gladiator battling for his life against a starving lion; the high curved walls of the orchestra and the back stage confining the combatants and protecting the audience; bustling Arcadiana Way, lined with roofed colonnades and commercial establishments, leading west to the busy harbor in the distance. My wife and I had joined a small, guided group of fellow travelers for a tour of the ruins of Ephesus, Turkey. The tremendous size of the ancient city and its range of sites had our heads spinning. This ancient metropolis of 150,000 was one of the most important eastern frontier cities of ancient Greece, then later, of the Roman Empire. Perhaps because Ephesus was an Asian province settlement, the Roman occupation preserved much of the original Greek building and influence. It was here that the Roman general, Marc Antony walked hand-in-hand with the Egyptian queen, Cleopatra, down the famous Marble Road. Here, too, the first Christians fled from Jerusalem to start spreading their beliefs, including Apostle John and Paul, author of the Epistles to the Ephesians. Its no wonder that todays visitor feels privileged to experience Ephesus classic history and grandeur. Ephesus position on the coast at the western end of a great Asian trade road created the ideal conditions for it to evolve into an important port city. Founded in the 11th century B.C. by Ionian Greeks, Ephesus was conquered in turn by the Cimmerians (7th century B.C. ), the Lydians (6th century B.C. ), the Persians, and again the Greeks (5th century B.C.). It was under Alexander the Great that Ephesus reached its heyday as a Greek port city and extended to include a long section of the Cayster River Valley. The Romans took control of the city in 189 B.C., and by the time of Roman Emperor Augustus in 27 B.C., Ephesus became the most important Roman city in Asia Minor. Although controlled by the Romans, Ephesus maintained a high degree of independence. 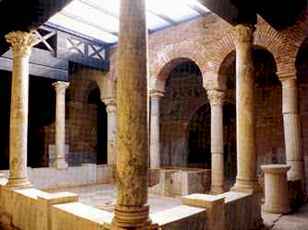 St. Paul established a Christian congregation in Ephesus in the 1st century A.D. Then in 262 A.D. the Goths destroyed much of Ephesus, forcing the Romans to rebuild it. In the Byzantine era, when Constantinople overtook Romes control of the Roman Empire, the Cayster River silted up Ephesus harbor, bringing an end to its importance as a trading port. The declining city was abandoned in the 14th century. We found ourselves overcome by the architecture, art, and urban features of ancient Ephesus. Included here are two theaters, two agoras (marketplaces), multiple temples to Greek and Roman gods, a huge library, multiple baths, public latrines with an underground sewer system, a brothel, fountains, gymnasium, stadium, basilica, palaces, an early Christian church dedicated to Virgin Mary, and private homes of rich Ephesian citizens. Our Turkish guide made Ephesus come alive with her tales of how the city functioned in its heyday. She showed us how the citizens shopped, cooked their meals, and attended the public baths, and even the toilets. She laughed as she showed how the brothel was hidden near the library at the center of town, with "secret" pictorial street signs pointing to the location. Celsus Library facade The story behind each site at Ephesus could provide days of interesting research, but our single busy day there opened up our minds and hearts to the ancient Greeks, Romans, Ephesians, and Christians at the crossroads of Asia and Europe. The most magnificent sites keep passing before our minds eyes: the Grand Theater with its view of Adriana Way; the Celsus library with its exquisite two-story façade, Hadrians Temple on Curetes Road, and the atrium and pool of a luxurious private residence. The librarys beauty is a tribute to its importance as a repository for 12,000 Roman roll books, or scrolls, all burned by the invading Goths in the 3rd century A.D. The librarys importance was also reflected in four superb, life-sized statues of Roman goddesses at the façade and the fronting auditorium where philosophers gave lectures and discussed issues of the day. Athens may have its Acropolis; Rome, its Coliseum; Pompeii, its temples and homes. 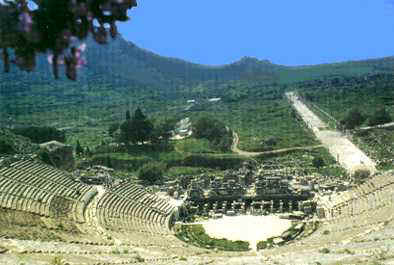 While Ephesus individual sites may not equal the best of these, its uniqueness lies in its preservation of both the Greek and Roman worlds at the crossroads to Asia. Ephesus is the most significant archaeological area that spans both civilizations, illustrating a period of importance that lasted more than 1,000 years. It highlights very graphically the Greek influence upon the conquering Romans. 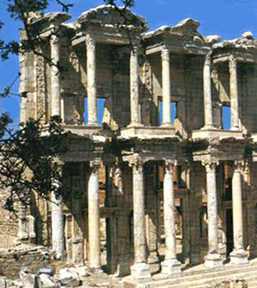 Thankfully, Ephesus history became frozen in time and is now available for all of us as todays marveled visitors. 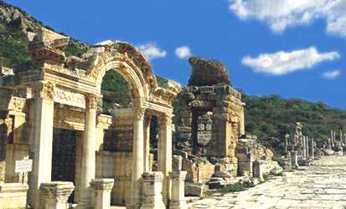 Click here for details to plan your own trip to Ephesus, Turkey.